With what’s going on right now in Yemen, Jordan, Syria, Tunis and Egypt, I get a lot of questions about how Saudis are taking it and what’s the reaction. The short answer is they are shocked and captivated but haven’t made up their minds about any of it. The long answer is Saudi Arabia is a country where 40% of the population is under 14 years old, unemployment is rampant and the conservative religious approach is the key to the majority. These three ingredients are a dangerous mixture and add to that the now available social media tools and you have a bomb waiting for detonation. So why has nothing happened? We have been faced with defeat over the last three generations. First it was with the Ottoman’s and I can’t tell you the countless times I’ve heard stories about how my great-grandparents generation faced off with the Turks in Qaseem. There are even walls still standing with bullet holes from then. Then my grandparents’ generation faced the creation of Israel. Every family knows a Palestinian refugee or had someone in their family killed or injured, my own grandfather was maimed in 1948 when Israeli forces bombed the hospital he was being treated at. Then my parents’ generation witnessed the fall of Jamal AbdulNaser’s high hopes and grand plans. After that every country in the region had its own version of dictatorship and people suppression evolve so that in the end you had different countries with different names but all sharing the same tactics and the same system. People have lost hope in being represented politically and have adapted and figured out other ways to move forward in life. This is the context and the lenses through which our young people are watching what’s going on in the region. And this is why that the fact that there was an uprising is not as important as the aftermath of that uprising. They are watching, though. All over the country, all these Saudis who rarely watch or read the news and their only interests in doing so are for more local social openness or conservativeness (depending on their background), are now carefully observing what’s going on in neighboring countries. Saudis who didn’t know what the channel number for AlJazeera News was on their receivers now have it saved on their favorites list. University and high school students are now watching the news and social media feeds in their study breaks instead of a rerun of Friends. It’s a new atmosphere. The thing lacking is analysis or a discussion on what it means for us. The only tangible effect is more outspokenness in their criticism of how the Saudi government was ill-prepared for the Jeddah floods. In just three days from the first Friday after the floods to last Sunday, there were one hundred and ten opinion pieces in Saudi newspapers condemning what happened and criticizing how the government handled things. Also Shiekh Salman Al Ouda broadcast an unprecedented episode of his MBC show where he spoke about how the government must listen to Saudi’s demands for more transparency and spoke highly of the movements in Tunis and Egypt. And then Ali Al Olayani, a popular TV presenter also dedicated a frank and brave show where YouTube videos uploaded by citizens in Jeddah were shown. And the most recent were reports of protesters in Jeddah and some being arrested and there was even a video that was taken down a day later of the protest where you can see men and women marching down a Jeddah street. We are only at the beginning and the only thing that has been determined is that Arabs are fed up and that we won’t back down. On Saturday the Libyan president (41 years in the presidential office and counting), Muammar al-Gaddafi, came out on Libyan TV to give one of his rambling speeches but this time it was worth listening to. He expressed what a lot of Arab leaders are probably feeling towards the revolution in Tunisia; fear. More importantly by speaking dismissively about Wikileaks, Facebook and Youtube, he gave them the credit they deserve. Online activism in the Middle East is reminiscent of the printing press revolution in Europe. At the time European dictators were unable to get ahead of the spread of information but by the time these tools got to the Arab world, political leaders already knew how to keep a handle on things. Now with technology, regular citizens are again ahead of the game. When I was growing up in Saudi, people were paranoid about being overheard complaining. Little kids had this ingrained in them and were told that “they” can hear you through the electricity outlets in the walls and that those nice neighbors next door are spies for “them”. People did not talk to each other and they did not complain because stories and rumors abound about some distant relative or acquaintance mysteriously and forever disappearing and about dark dungeons in palace basements. Never before the internet could everyone and anyone who cares have gotten their hands on the piece that got Dr. Al-Abdulkareem imprisoned indefinitely and without trial. Nor could they have expressed their support in such huge numbers online that the government becomes powerless in quieting them. What Twitter, Facebook, blogs, Youtube…etc do in the Middle East is that they confirm our hunch that our fellow citizens feel the same way. And this alone is a powerful realization, and now we’ve taken it a step further by connecting, forming online groups and contacts that occasionally develop into real meetings and groups on the ground. The division and isolation that was upheld and so valuable to Arab leaders has now become a thing of the past. And now Arab governments are struggling to get back in control but so far they only sink deeper. Like when Dr. Abdulkareem published his piece on his Facebook page, he was shortly later detained. If it weren’t for his detention, not many people would have read what he wrote. Only those politically involved would have sought it out, but after the widely shared news of his imprisonment, everyone wanted to know what it was that he wrote. It was Emailed, BBMed, and printed out and shared with those of us who aren’t online. So the government’s traditional approach actually caused the piece to become more widespread and for the offending writer to gain supporters in the thousands. This is just the beginning, and we will soon outgrow the current online tools. Activist journalism is now catching on. People can no longer tolerate just being aware of what’s going on, they need to be able to do something about it. Right now the “happening” thing is petitions such as on Change.org and Avaaz.org. On Change.org, anyone can write up a petition about an issue they care about, and if it concerns an American politician there’s a drop down menu where you can click their name and automatically get it sent to their Email inbox. If it’s international, the writer has to find the Email address of the targeted politician for themselves. It’s a fantastic tool and it would be empowering if we could have a similar kind of website made by people of the Middle East and in Arabic. Even better, the Saudi Ministry of Culture and Information could have taken up such a project instead of their flailing attempts at controlling the Saudi online community. To give citizens that kind of access and outlet where they can petition their issues online would help a lot in letting out the average citizen’s frustrations. It would be like a national council where every citizen is a member with a platform. The only way anyone in this region is going to remain in power, is by adapting to this new internet age rather than sticking to the traditional methods of suppression; more transparency, more freedom of speech and above all more power to the people. Several companies and shops are employing women as cashiers who serve both men and women as families. Each day these women cashiers meet dozens of men, and speak to them while handling back and forth money and receipts. In addition these women cashiers are required to undergo training, attend meetings and interact with their colleagues and supervisor at work. What is the ruling on women working as such? What is the ruling regarding companies and shops that recruit women? Please advise. There is a glimmer of hope here though. First off, this council, throughout its history, has prohibited things that remain legal, such as music and satellite TV channels that are not Islamic. So this fatwa might join the list of things that Saudis feel unwarrantedly guilty about but still do. It would be a shame if another door closes in the faces of women who are in desperate need of jobs. 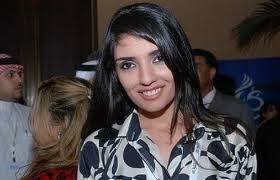 Two areas that ultra-conservatives have a stronghold on in Saudi are the judicial system and the education sector. These ultra-conservatives do not pay much heed towards the banking sector, healthcare, commerce and all other areas. But when it comes to our courts and our schools, they just won’t budge. In this post I’m going address the education sector and their control over it. This control goes way back to 1960 when it was decided that girls will be allowed to get an education. Men from all over but mainly from Qaseem travelled to the capital to express their opposition even though the girl schools were completely gender segregated and had a separate administrative body overseeing it from the education ministry overseeing the boys’ schools. Throughout the years, the ministers of girls’ education were overwhelmingly long-bearded muttawas and the whole ministry favored employing people who were religiously conservative. Those were the days when mirrors were banned from bathrooms, and uniforms that define the waist or have a belt were against the rules even for teachers. All our beautiful little girls were dressed in bland gray or brown cloth cut into the shape of your grandma’s full-length and long-sleeved house dress. If they cut their hair too short they were punished, and if they styled or let their long hair down they were punished. Stories about principals putting Vaseline in girls’ hair as punishment abound. Around 1974, the idea that elementary schools would not be gender –segregated was floated around. At that time Shiekh Bin Baz and Sheikh Bin Othaimeen were the most prominent religious leaders. 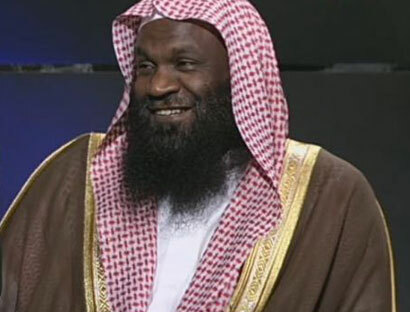 A news organization recently unearthed correspondence that is alleged to be between the two sheikhs in which they were conspiring on how to stop the sinful mixing of boys and girls in elementary schools. Scans of the handwritten letters are also shown in the report. The country’s concession to the religious establishment’s control over girls’ education stayed pretty much the same through out the 1980s and 1990s. Things changed on the 11th of March 2002, but only after 15 girls died in a fire after the PVPV obstructed the entrance to the school. The PVPV did not let out students who weren’t covered and did not allow the civil defense to enter the school. HRW and BBC Reports of the incident. The separate ministry responsible for girls’ education was absolved and the administration of girls’ schools was put under the care of the main education ministry that was already overseeing the boys’ schools. How has this changed things on the ground? Not much. Most girl schools are locked during school hours. Physical education is still banned for girls. Subjects are still gender-specific, so that there’s a different science book for girls than the one for boys and so on for all subjects. Some of the things that have changed are the uniforms. For the past three years, elementary girls wear a plain white or striped blouse with a sleeveless gray overdress and the same for older girls except that the dress is navy. Both have defined waists. It’s an improvement. The biggest changes are that since last year, principals are given the freedom to choose to allow boys from first to third grade, on the condition that classes would be segregated. The point being that boys at this young age would be better off taught by female teachers and to open up more positions in the education sector for unemployed women. This gender mixing of course is being fought by the religious establishment just like in 1974. 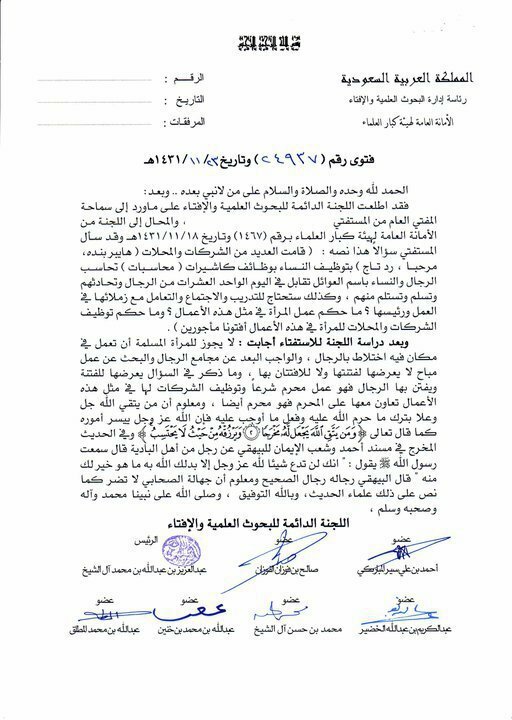 Shiekh Yousef Al Ahmed escorted a band of muttawas to object this decision at one of the education ministry offices. A judge published a piece on a hypothetical situation where a first grade boy is so attracted to his teachers that he flunks on purpose to stay in the girls’ school for as long as possible. Then 20 years later he still can’t stop thinking about them so he finds and hooks up online with one of his elementary teachers resulting in her divorce. In their minds this is not at all far-fetched. As you can see, about a quarter of the time a student is at school, she is learning religion. All that time learning religion and morals and yet our whole society has a culture of unofficially and officially policing each other otherwise we would go wild. After all that religious teaching and our students can’t even Islamically behave in malls so men are banned from entering them without their families because before the ban many harassed and chased women shoppers. 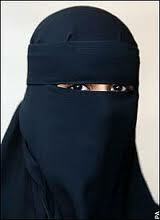 Women can’t walk in the streets fully covered head to toe without being harassed. Work ethics, honesty and abiding laws are not widely practiced concepts. So what’s the point of all those religious classes if they don’t translate into a moral society? 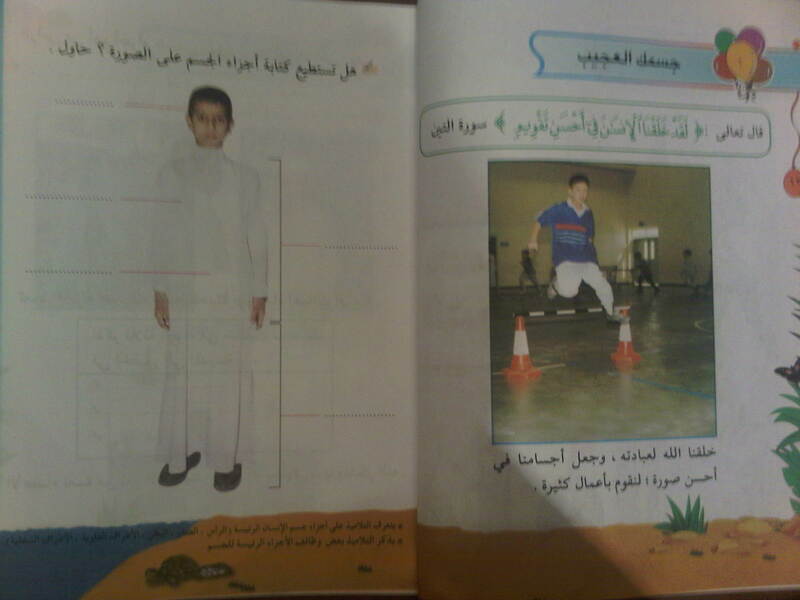 The Saudi textbook is 145 pages. Most pages only have a few sentences. 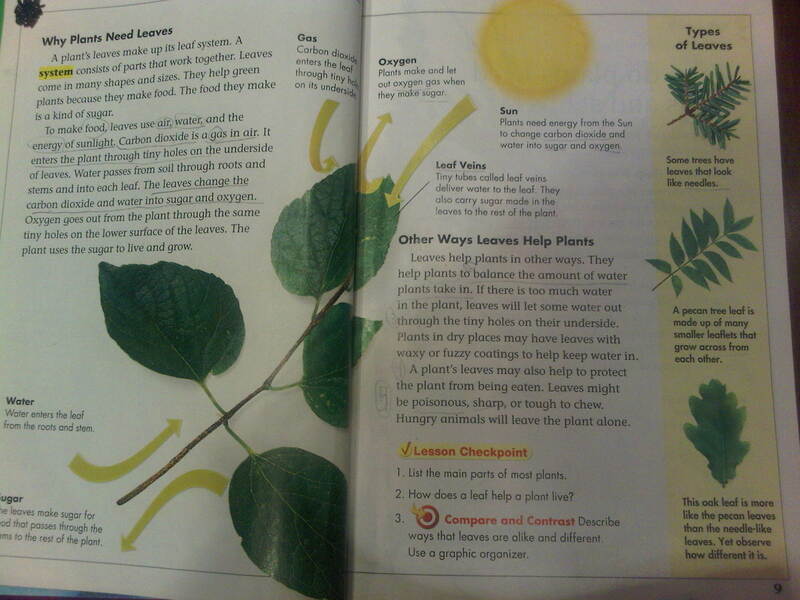 The American textbook is 495 pages, has a glossary, index, many experiments and most pages contain several paragraphs. Lastly, there’s the teachers. In all the schools I’ve been in, here in Riyadh and Tabuk, they averaged 30 students per class. Teachers could be given a maximum of 24 periods per week. So if you are a history teacher and each class has two periods, then it’s possible that you would be asked to teach 12 different classrooms. And at 30 students per class, that’s 360 students. That’s quite a feat for a schoolteacher. The workload is only one aspect of how things are. The female teachers I’ve talked to, also complain about not having any health insurance, about being locked up during school hours and having to convince the principal before being allowed to leave and about gender discrimination when it comes to how pensions are paid out. I know that the current ministry has big plans for education but they also have mountainous challenges. The religious establishment having had control for so long, their people are in almost every office, dragging their feet against anything that even smells western. The current teaching staff is a product of the very same system and has not known any other, getting them to change would be a miracle. Miracles have been known to happen. ..Right now praying for one, is the only thing I can do. Getting to the Middle Ages is not about time machines, it’s a geographical issue. Why have dinner at a cheesy Medieval Times when you can get the authentic experience right here in Saudi Arabia. We got everything you want. 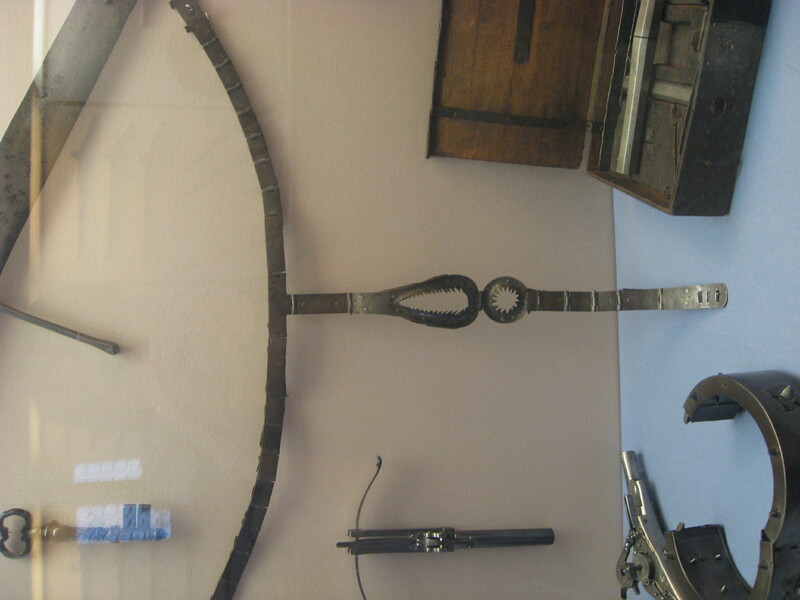 I came across this chastity belt at a museum and it got me thinking. A man that asks his wife to wear this is basically saying your morals and character are not enough; I have to dress you in something to protect you. And that is the same argument that is used in our modern times Middle Ages to get women to wear niqabs! Then there’s the guardianship system over adult women, the sponsorship system, that’s not unlike a master/slave relationship, over guest workers and finally the cherry on top is the latest decision to limit religious ruling to a legislative body that is made up of ultra conservatives and their friends. Did I hear somebody say “medieval Vatican”?! No, no this is Saudi Arabia, we’re Muslims. This new decree by the King is supposedly to protect Islam from embarrassing fatwas like the recent adult breastfeeding fatwa and the much more serious call to kill all satellite channel owners who broadcast sinful shows. But to the ultra-conservatives, it’s a miraculous bestowal of victory and return to power. Recently average Saudis got a glimpse of the inner workings of religious fatwas and how even seemingly conservative long bearded muttawas think it’s ok to enjoy music and that gender segregation is not Islamic. People (or what our religious establishment calls “commoners” العوام) started thinking and looking things up for themselves. And that’s where this new legislation comes in, a return to the status quo. However the optimist in me does not think it’s all bad. First of all it’s too little, too late. With internet and TV in almost every home, you can’t control who people listen to anymore. And secondly I’m hoping the whole thing is to appease the ultra conservatives in order to get them to pass something ultra liberal like …..fingers and toes crossed…..lifting the ban on women driving!? Since the passing away of the two major sheikhs of Sunni Islam in Saudi Arabia, Shiekh Bin Othaimeen and Sheikh Bin Baz, no one has been able to take their place. Their extremely conservative interpretation of Islam has gone unquestioned throughout the 1990s and until now. They were the ones that issued the religious decree that women should be banned from driving cars. They also prohibited women from several things; showing their faces in public, wearing pants, prioritizing education and even the inane issue of shaping their eyebrows. The vacuum that was left by their passing has never felt so empty until recently. With the numerous sheikh fatwa shows and the everyday emergence of new news websites and forums, all these sheikhs have come out of the woodwork scrambling for fame. In the beginning everyone was following the old worn extremist track that Shiekh Bin Othaimeen had set down long before. It almost seemed like a new Islamic sect under Bin Othaimeen’s teachings was emerging, especially in the Central region. His word was last and no one dared to refute a fatwa of his. Then Ahmed Al Ghamdi came out with a fatwa stating that it was alright for men and women to mix together. and it was like a wall has broken down and every sheikh suddenly got the guts to say what they really think. We have all heard about Shiekh Al Obeikan’s breastfeeding fatwa and then Shiekh Al Kalabani came out with a fatwa stating that music is allowed. 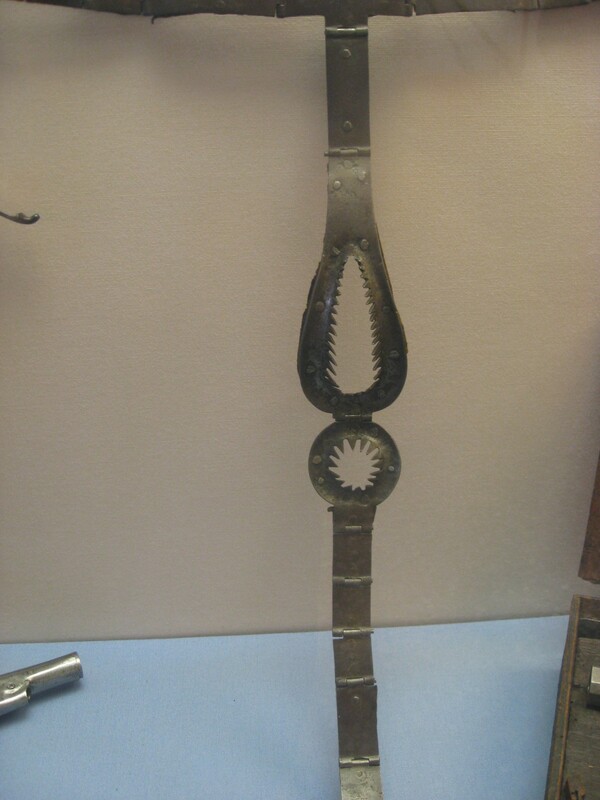 The traditional stance on music is that it is prohibited and that if you listen to it melted iron will forever be poured into your ears come judgment day. So when Al Kalabani revoked that, he too drew major criticism and even accusations of intentional decadence. With Al Kalbani, he seemed to have “I’ve nothing to lose” attitude, after being fired from his prestigious position as the Imam of the Makkah grand mosque. Why he was fired, there are no factual reports but the strongest rumor is that it’s due to him openly opposing King Abdullah’s plan to include Shia shiekhs in the Council Assembly of Senior Ulema. And now it’s rumored that he not only became less of a conservative but that he had also changed his position on the inclusion of Shia Shiekhs. This trio, Al Obiekan, Al Ghamdi, and Al Kalbani are being attacked by the same people that made them. Members from the Council Assembly of Senior Ulema and other conservative sheikhs are doing everything in their power, short of a death fatwa, to shut these three up. I know it’s crazy but breastfeeding an adult man is on par with gender desegregation and listening to music. And then of course, you have our charming Shiekh Al Arefe making a fool of himself when he couldn’t keep his promise that his next show will be filmed at the Jerusalem mosque, and the Al Najaimi scandal when he was caught on camera mingling with women at the Women’s day conference in Kuwait, despite his support for an extreme gender segregation fatwa by sheikh Al Barack. All this squabbling and desperate thirst for fame from sheikhs has led more and more Saudis to the conclusion that yes, sheikhs do make mistakes and you can disregard them. And this has never been so evident as it was last Friday, after a member from the Council, sheikh Saleh Al Fowzan, issued a fatwa that it is prohibited to be led in prayer by sheikh Al Kalabani and yet five thousand men showed up to Al Kalabani’s mosque here in Riyadh. The people of Saudi Arabia are finally starting to make up their own minds!